What Is Display Ad Viewability, and Why Is It Important to Marketers? Viewability has become a hot topic in the advertising industry over the past few years. But what exactly is viewability, and why is it a big deal? Viewability is an online advertising metric that only tracks impressions that can actually be seen by users. For example, if an ad is loaded below the fold of the page—and a user doesn’t scroll down to see it—then that impression is considered NOT viewable. According to the Interactive Advertising Bureau (IAB), a “viewable” impression for a standard banner ad is one that is at least 50% visible for one second or longer. Rich media or large format ads are considered viewable if at least 30% of the pixels are in view for a minimum of one second. Desktop video ads are considered viewable if 50% of the video’s pixels are viewable for a minimum of two seconds. These guidelines were developed to help publishers and advertisers determine which ad impressions are considered valid, and therefore billable. 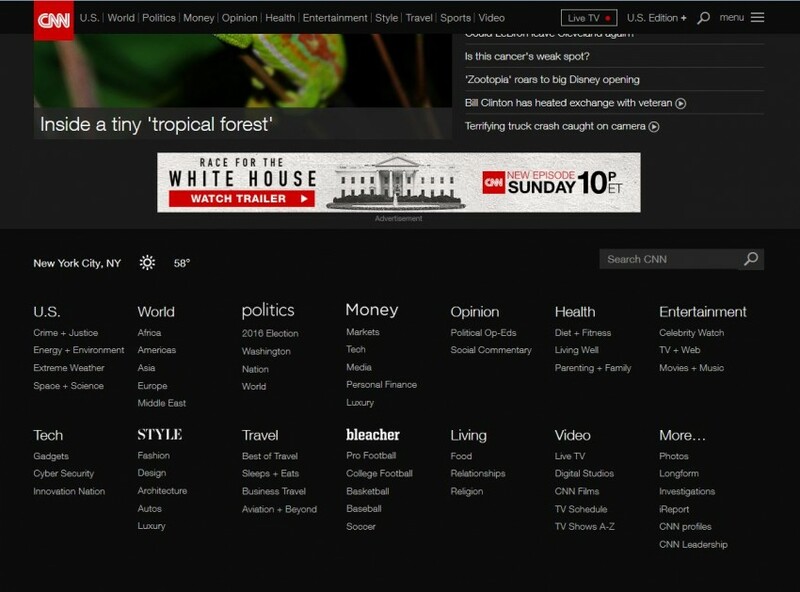 This screenshot shows the very bottom of the CNN.com homepage. If a user never scrolls all the way down the page, they would never see these ad units. The standard ad-serving technology would count this ad load as an impression, but if it doesn’t meet the IAB’s standards, then it won’t be considered a viewable impression. Depending on your source, currently (as of March 2016) around 60% of ads are not viewable. Advertisers are concerned that they should not be investing in media that simply isn’t viewable to their consumer. Publishers have introduced a viewable Cost Per Thousand (vCPM) cost structure model where advertisers only pay when their ad is seen. 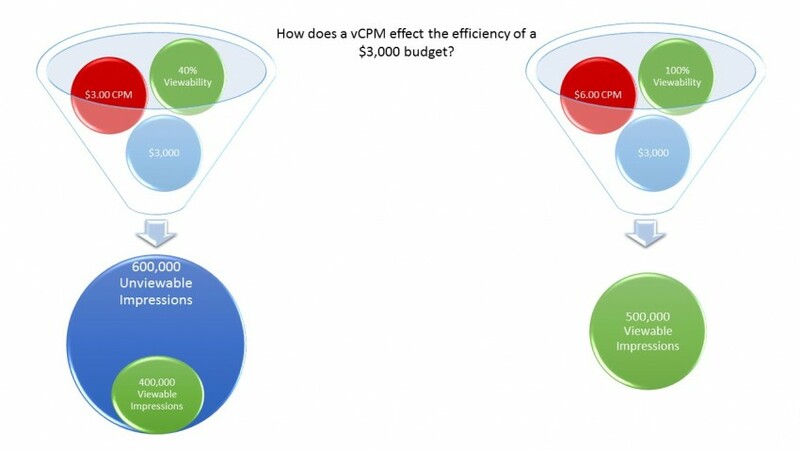 Most of the time, these vCPMs are 30-50% higher than a standard CPM. Until there is 100% viewable inventory in the marketplace, advertisers need to be prepared to spend a premium to get that inventory. Even with a 50% higher CPM, with the same $3,000 budget, advertisers can purchase more guaranteed viewable impressions. Agencies and advertisers should invest in companies that are accredited to track viewability. Some major brands, like the Kraft Foods Group, have stopped spending with publishers that won’t allow third-party viewability verification. To them, viewability is very important and they will only put dollars behind impressions that they know they can measure and validate. Check out the full list of MRC accredited digital partners. While the industry has made great strides with developing standards for viewability, achieving 100% viewability in 2016 is still unreasonable. Limitations with current technology prevent our industry from fully measuring all served impressions. Many high impact placements are still not consistently measurable, along with mobile and video. Other unmeasured impressions are the result of back-end capabilities—cross-domain iFrames, or failure for viewable decision tags to fire. It is important for agencies and advertisers to remember that as we continue to work to improve viewability measurement, non-measured impressions shouldn’t be assumed to be non-viewable impressions. Like all aspects of digital advertising, measuring viewability is a technical challenge that requires perfecting before advertisers can accurately calculate viewable impressions. Many industry experts look at this topic as an opportunity to shift the standards for monetizing online real estate. Publishers may choose to redesign their sites so that there is less inventory, but the inventory is more viewable. This will improve the user experience (UX) by de-cluttering web pages. Our industry is far from transacting viewability as a standalone metric, but it should be used as a quality assurance layer. Businesses should be using viewability as a tool—an efficient way to run smarter advertising and provide valuable insights—but not as the only Key Performance Indicator (KPI) in itself. Impressions should not be separated as viewable versus unviewable. Businesses should be looking at the value of viewability. This is done by comparing viewability levels against their conversion results. Most viewable inventory lies at the top of the page, but that inventory may not drive the highest return on ad spend. On mobile, a 100% viewable ad may mean a disruption to the flow of information or UX. By using viewability as a touchpoint in conversion measurement, any correlation that exists can be used for strategic optimizations to enhance the efficiencies of the campaign. According to a recent study by IPG Media Lab, while there are many variables to viewability and ad effectiveness, a common denominator is that time is king. How long consumers have to see the ad is a major factor in ad effectiveness and is a much better predictor of whether or not a consumer will be able to recall the ad. Consumers desperately need more time to see the ad in order to connect with it. Check out the full viewability study done by IPG Lab here. The rise of viewability has been a great development for advertising. Viewability will drive quality inventory in the marketplace, which benefits the advertiser as well as the publisher. As we develop viewability as a metric, advertisers should focus on the value of adding viewability metrics to their analytics, weighted against objectives, cost, and conversion increases. IAB and MRC standards don’t guarantee ad effectiveness, but do ensure that ads and advertisers have the opportunity to be seen. The effectiveness of the ad ultimately rests in the hands of the creative and targeting strategy. Viewabilty is just one of the many metrics businesses should look at in determining an ad’s success.